You may stare in judgement at those diners praying over their meal before they eat, but in North Carolina, religious folks are to be rewarded come bill time. Mary's Gourmet Diner, a restaurant in Winston-Salem, N.C., is getting attention for its policy of giving praying customers fifteen percent off their bill. Owner Mary Haglund told The Blaze that workers have been offering the discount sporadically for about four years. "For me, every plate of food is a gift. And I never take that for granted and when I see someone in a restaurant honoring their gratefulness at my table . . . it touches my heart," she said. 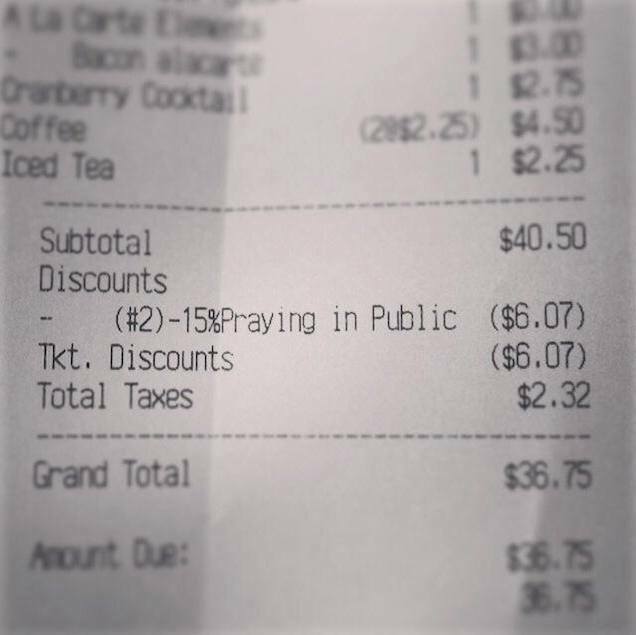 Word spread about the discount when Jordan Smith, a customer on a business trip, stopped by for breakfast on July 30 and posted her "praying in public" discounted receipt to Facebook. The Florida-based Christian radio station Z88.3 posted that same receipt to its Facebook page, and now this praying-in-public thing seems to really be catching on.